The table is from a recent briefing paper on The State of the Nation by CEBR, a backgrounder to the UK general election now under way. The paper highlights the extraordinary increase in public expenditure as a share of UK GDP (the authors estimate that about 2/3rds of the UK's fiscal crisis has been the result of an excess rise in public spending and only 1/3rd from the recession). Of interest to us in the South is the extraordinary picture it paints of Northern Ireland. It seems we're living next door to North Korea. Public spending accounts for £7 out of every £10 of the North's GDP (71%). When Labour first came to power the NI share stood at 57%. 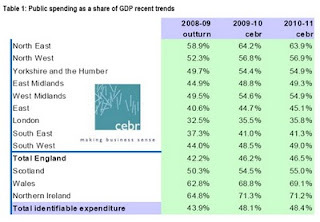 The problem for Northern Ireland (and at one remove, for us in the South) is that whoever wins the election on Thursday is going to have to engineer a radical reversal in the trend increase in public spending relative to GDP - and the North will feel the most pain as a result. But feel the pain it must. The 1970s were the turning point in modern history. Statism was exposed as a flawed economic system. The more idealistic countries like Denmark and New Zealand reformed most rapidly when new information showed that markets worked better than government. You’ve heard me talk ad nauseum about Denmark, which is number one in all sorts of rankings, from free markets to happiness to equality to civic virtue. But I actually looked at all 32 economies with per capita income above $20,000/year (i.e. as rich as Portugal.) Interestingly, just as Denmark was number one in both markets and civic virtue, the same country placed dead last in both the free markets and civic virtue rankings. And what is the country with both the lowest level of civic virtue and the least reformed statist economic system among 32 developed countries on four different continents? You’ve probably guessed it by now . . . Greece. It isn't easy for politicians to convince themselves that reducing the role of the state is a good thing - let alone for them to convince the electorate. After all, the entire purpose of politics is to secure the power to make others do what you want, and the state is the medium through which said power is exercised. But politics is the art of persuasion and eventually the survival of the state/nation/democracy requires a reduced role for the state. I think we intuitively understand this in Ireland, which is one reason we haven't gone Greek. The more constraints that are put on our thought and behaviour, the more difficult it becomes for people to take full and proper and satisfying responsibility for their lives and their experiences. Not a single one of the political parties in the running for our votes on 6 May understands what freedom means or why it is so important. They don’t understand that freedom is good for individuals, allowing us to live more independently and less burdensomely, and is also good for society, tying individuals together through free association, shared experience, and having to work out for ourselves what we want our society to look like. Maybe I'm biased, but I think the people of Northern Ireland are smart enough and capable enough to create a better society, one that will allow them individually and collectively to forge a better, more secure future for themselves and future generations. Whether, of course, their politicians have the imagination to step back and let a better society emerge remains to be seen.